I was thrilled when Pottery Barn asked if I wanted to create a tabletop with their new Under The Sea collection. You know I love a good tabletop challenge and I decided to take this party in a tropical direction. My party is inspired by tropical ecosystems. 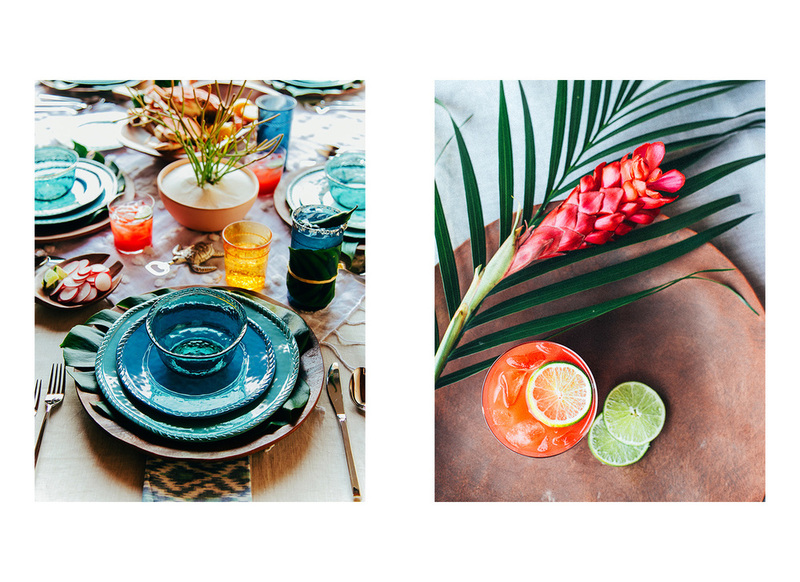 From cocktails made from tropical fruits like lychee and guava to floral details utilizing sculptural pieces like Birds of Paradise and cacti and succulents reminiscent of tropical coral reefs, the table is warm, lively, unexpected and fun. The menu includes ceviches and crab legs, foods wrapped in banana leaves with lots of spicy salsas and tangy side-dishes. With soft Brazilian jazz playing in the background, this party is a perfect blend of upbeat and relaxing.